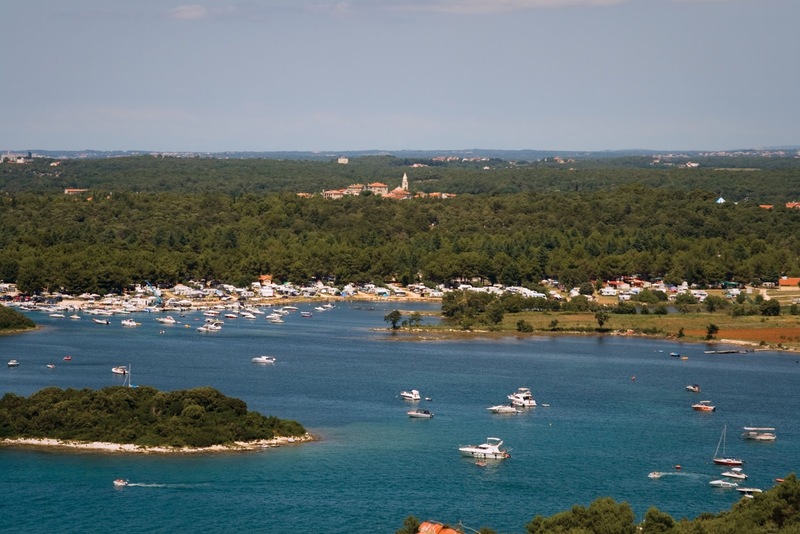 Vrsar and Funtana are two small fishing settlements located between Porec and Lim Bay. Since ancient times, these villages supplied sailors with drinking water from springs by which both places got their names. Today, they’re modern tourist centers with serene island archipelago, blue sea, and green environment. It’s a great place to enjoy nature, taste the distinctive, traditional cuisine unique to this region, and take part in daily panoramic, fish picnic excursions to Lim Bay and Rovinj. The city of Vrsar, a picturesque hilltop village, has seen it all, from its earliest prehistoric hill fort to its current status as one of the most well-kept, neat and tidy resorts on the Istrian Peninsula. Taking its name from the pre-Illyrian Usaria, translating "ur" to "springs", Vrsar and the nearby village of Funtana provided important water resources for seafaring visitors. With the Roman era followed by Goth, Byzantine, and then Carolingian rule, Vrsar emerged as a free municipality during the Middle Ages, ruled by its own bishops from the 13th to the 18th centuries. It then became part of the Austrian empire (1813 to 1918), followed by Italy (1918 to 1943), and Yugoslavia after WWII. Known for its quarry, the summer sculptors school at Montraker is a popular August retreat. As the Porec Bishops' summer residence, Bishop's Castle is another important 12th century landmark with a beautiful view of the Lim Bay, a 12 km fjord with crystal clear water perfect for swimming or harvesting shellfish. Vrsar also has a bit of a wild streak, perhaps initiated by Giacomo Casanova's exciting visits and memoirs of the 18th century. It is known as the home of the first commercial naturist (nudist) camp in Europe, Koversada. With deep roots, Vrsar spans the ages from ancient to modern, serving tasty seafood cuisine, providing comfortable seaside lodging, and sharing a beautiful archipelago of 18 uninhabited islands with tourists from around the globe. - Aeropark Vrsar: Panoramic flights and skydiving over Istria. - Old City Walls and Streets: Multiple historical layers of the streets and walls. - Dzamonja Sculpture Park: Beautiful park with a variety of Croatian artwork. - Diving and Sailing: There are many diving centers in Vrsar. Starfish Diving Center provides memorable diving experiences. - Sv. Juraj Island: Nice one-day escape. - St. Martin Church: Parish church. Climb to the bell tower for panoramic views. - Water Sports: Learn windsurfing at the Sport Center Montraker. - Boat Trips: Enjoy a scenic boat ride to nearby Lim Bay. - Biking: Vrsar is connected to Porec via a cycling trail by the sea. There are also cycling paths through vineyards and toward Lim Bay. - Flengi: Farming village between Vrsar and Lim Bay with fresh local produce and numerous splendid small restaurants offering freshly roasted meats at amazingly low prices. - Montraker Live Festival: Rock festival of Croatian and international musicians in mid-July. - Koversada: One of Croatia’s most famous naturist resorts. - Accommodation: Hotel Pineta, Hotel Vista, Resort Petalon; Resort Funtana, Resort Belvedere, and Apartments Riva. Additional information about Vrsar is available at Vrsar Tourist Board. 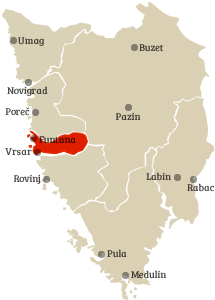 Funtana gets its name after the local fresh water springs which served as a source of drinking water for the Porec area. The town was developed in the 17th century by Bernardo Borisi, the Lord of Funtana, to whom Venice awarded this estate. During summer droughts, people from distant villages travelled great distances to get fresh spring water from this site next to the sea, creating many paths to the village. Today, Funtana still has the appearance of a typical seaside village with fishing and fertile agricultural land, making it a delight to visit. - Water Springs of Funtana: See the famous water springs of Funtana, after which the town has been named. - St. Bernard’s Church: Dates back to the 17th century. - Gallery Zgor Murve: Art exhibitions. - Dinopark Funtana: This park is set within natural forests and offers refreshing walks over more than 1.5 km of walking trails. Children under 8 will enjoy the park most, especially the life-size animatronic dinosaurs that move and roar. There’s also an amusement park with rides for children under 8. - Sailing: Sail out and follow the Odyssey’s footsteps along Funtana’s coastline. - Beaches and islets: This part of Istria has the most indented coast in Istria with many bays and islets. There are also many nudist beaches in Funtana. - Nature: Lots of unspoiled nature to explore. - Accommodation: Maistra Resort Funtana and Villa Maja. Additional information about Funtana is available at Funtana Tourist Board.